HERE we are at the end of the autumn holidays, it's the Anzac long weekend, and it's going to end in style with the annual Byron Bay Malibu Classic running at Wategos from today until finals day on Sunday. There's actually some prize money this year in the more specialised events, which should draw some serious talent out of the woodwork. Yet the real soul of this comp has always been this: It's not run for profit by the organisers. It's all about raising money for charities. 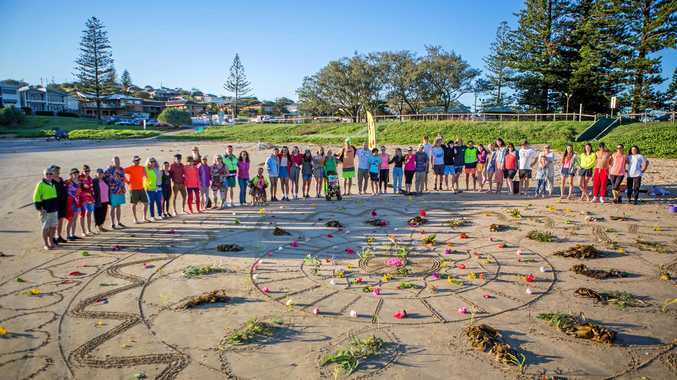 The beneficiaries will be: Cape Byron Headland Trust, Marine Rescue, Westpac Life Saver Rescue Helicopter, The Uncle project, Youth Activity Centre and the Cancer Council of Australia. So if you can, get along buy some food and a t-shirt, and be a part of supporting these great charities and our local community. It'll be a fun event. All week we've had a small but consistent easterly trade wind swell. However that's about to come to an abrupt end, sometime tomorrow afternoon. Not so much in the way of the swell dropping, but rather in the form of a fast moving, short period south swell. There are two low pressure troughs sweeping up the east coast. They should be pulling a fair sized, 2-3m southerly wind swell with them. It's unlikely to get seriously good, due to the rapid growth of this swell. It simply hasn't had enough time to get itself organised into clean, long period lines. Be that as it may, it doesn't mean that there won't be any size to it. At the south swell magnets at least, it could get big, but also pretty rough and messy. So size, yes, but quality, maybe not so much. The main issue with this swell, is simply that these troughs are moving way too fast to actually intensify and spin up into a decent east coast low. It's more like a late summer southerly buster that comes racing up the coast, pulling a mess of wind swell behind it. What this means is that the northern facing points are unlikely to pick up the bulk off this swell for a few days. Short period tends to not refract well. However the upside is that, due to the speed of the systems generating it, this swell will very quickly swing towards the southeast and then the east in its final days. During this phase, there's a reasonable chance we'll be spoiled for choice with a few mid-sized fun waves. Just a heads up, be very careful on the southern facing lee of the headlands after this swell hits. These short period, messy wind swells tend to generate radical rips at the northern ends of the more easterly facing beaches. These kind of swells have been known to drown unsuspecting tourists. Have fun, wait your turn, and surf today like you want to surf again tomorrow.